The North Dakota Business or Farming Corporation Articles of Incorporation | Form SFN-16812 must be filed with the North Dakota Secretary of State when forming a profit corporation in this state. This paperwork may require additional documents as per the nature of the exact type of the corporation being formed. For instance, if forming a professional profit corporation, you may be required to submit the approval of a licensing or regulatory board or if this is a farming corporation then you must include attach the Initial Report for For Farming or Ranching. Additionally, the articles of incorporation used here only satisfy the requirements of the North Dakota Secretary of Stat and does not exclude requirements placed upon entity formation by other governing bodies with authority such as the Internal Revenue Service. Regardless of any additional paperwork or provisions that must be submitted with the North Dakota Business or Farming Corporation Articles of Incorporation, you submit a Full Payment for the Filing Fee when submitting this form. The Filing Fee is $100.00 and is payable with a check made out to Secretary of State. You may also pay this fee using a major credit card (Discover, MasterCard, or Visa) however you will need to fill out the “Credit Card Authorization” form at the end of the North Dakota Business or Farming Corporation Articles of Incorporation packet. You may pay by credit card regardless of how you file but you may only pay be check if you are mailing in the articles. You may either Fax the articles to (701) 328 – 2992 or you may mail them to Business Registration Unit, North Dakota, State of North Dakota, 600 E. Boulevard Avenue Department 108, Bismarck, ND 58505-0500. Step 3 - In Article 1A, enter the Full Name of the corporation you are forming in the space provided. Include one of the mandated corporate designation suffixes (i.e. Corporation, Corp., Incorporated, Inc.). Step 4 - In Article 1B, enter the Full Address of the Principal Office on the blank line. This may not be a P.O. Box Number address but the physical location of the Principal Executive Office. Step 5 - You must choose between Article 2A or Article 2B. Do not fill both of these in. 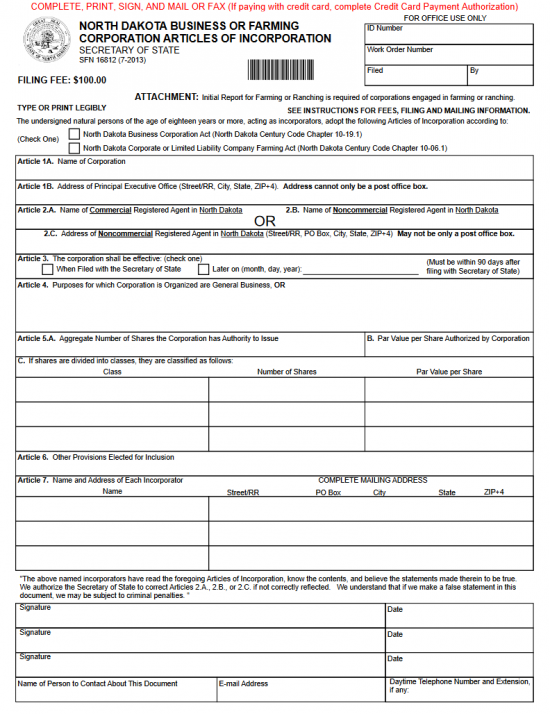 If you have obtained a North Dakota Commercial Registered Agent then fill in his/her/its Name in the space provided. If you have obtained a North Dakota Noncommercial Registered Agent then fill in his/her Full Name in the space provided. If you have obtained a North Dakota Noncommercial Registered Agent then fill in the Address of this entity’s Registered Office in Article 2C. Step 6 - In Article 3, indicate when you would like these articles to go in effect if approved. If you would like this to happen when they are approved then check the first box (labeled “When Filed…”). If you would like this to occur at a later date, within 90 days after filing, then mark the second box labeled “Later…” then enter the desired Date of Effect on the blank line. Step 7 - In Article 4, document the Purpose of this corporation. Include why it is being formed and how it will conduct its affairs. Step 8 - In Article 5A, report the Total Number of Authorized Shares this corporation may issue. Then, in Article 5B, report the Par Value of these shares. Write in the word “None” if there is no par value. If the Par Value is different for different classes, leave this blank and continue to Article 5C. Here, in Article 5C, fill in the Class, Total Number of Shares, and Par Value per Share in the table provided (if this is common stock then leave this table blank). Step 10 - In Article 7, report the Full Name and Full Address of each Incorporator in the table provided. Make sure to fill in the applicable information under the column headings (Name, Street/RR, P.O. Box, City, State, Zip Code). Step 11 – Below Article 7, each Incorporator must Sign his/her Name then write in the Date of their Signature. Each Incorporator listed, as per Article 7, must provide a signature and a date for that signature. Step 12 - The last line of this document must contain information for the individual the North Dakota Secretary of State may correspond with concerning these articles. Enter the Name of the Contact Person in the first box, the Email Address of the Contact Person in the second box, and the Daytime Telephone Number (including any available extension) in the third box. Step 13 - Organize all attachments and required filings that must be submitted with the North Dakota Business or Farming Corporation Articles of Incorporation into one package. Make sure each document has a clearly understood Title. If you are mailing these articles you must include a check, payable to Secretary of State, for $100.00. 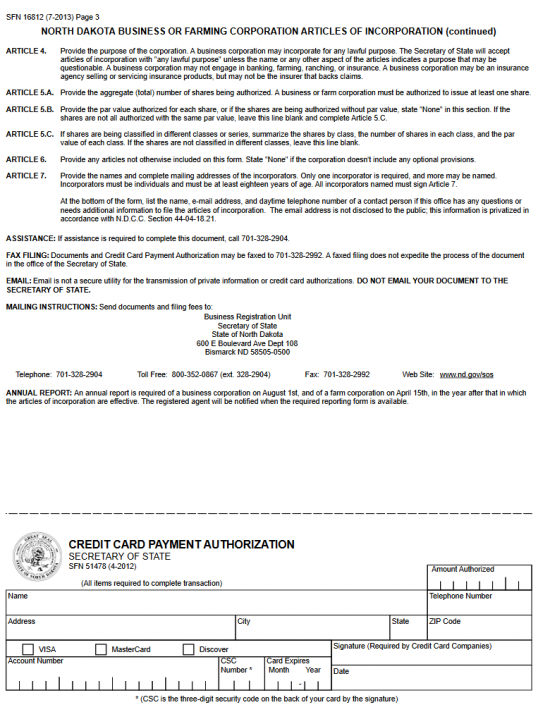 You may pay by credit card whether you are submitting by mail or by fax. This will necessitate filling out the Credit Card Authorization form at the end of this document. Here you will need to provide the “Amount Authorized” in the top left hand corner. The Card holder’s Name and Telephone Number on the first line, the Address on the second line, the type of card used on the third line, and the Account Number, CSC Number, and Expiration on the fourth line. The card holder must sign his/her Name and Date this document in the bottom right hand corner.